A large balcony and a wonderful view in a quiet area. This wholly renovated apartment is located at the end of a little street in a private area of Port Grimaud. It is on the top floor and has a superb panoramic view on the canal and the entrance of the harbor. 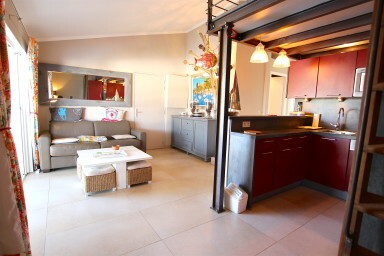 It is composed of a living-room with a well-furnished open kitchen, 2 bedrooms with a double bed and a shower-room. A large balcony to have lunch while enjoying the astonishing view. The shuttle station is next to the building - perfect to wander in Port Grimaud on the canal. An apartment with high-quality services for up to 4 people!